Malta made its way onto my travel bucket list when I was living in Qatar and I kept hearing about it from other travel bloggers. 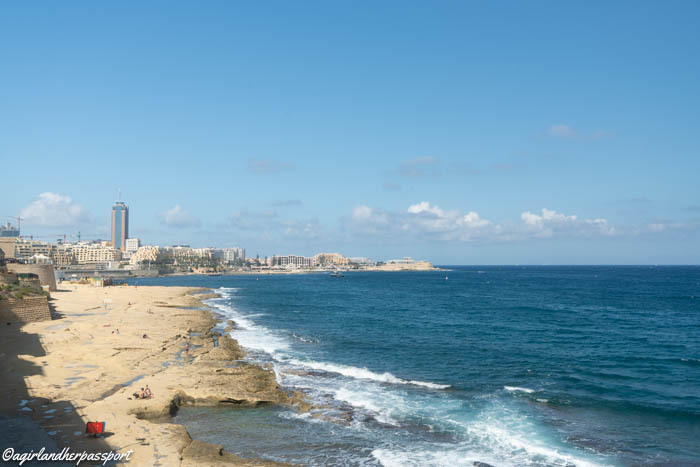 It doesn’t hurt that it is an island as I have a weakness for them and there are so many things to do in Malta. Since I was working my way West after Greece, Malta made a logical next stop. Malta is located in the Mediterranean Sea between Sicily and North Africa. 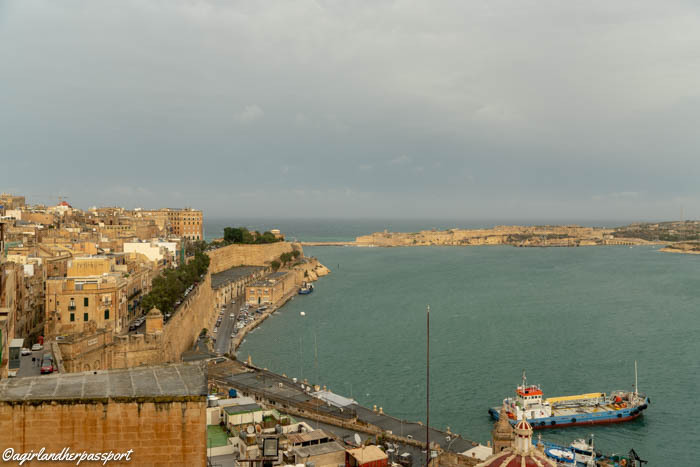 It consists of 18 uninhabited islands and three inhabited that include, Malta, Gozo and Comino. Malta is full of history and beautiful architecture. Malta is not very big but much of the places to see are spread out and the public transportation is not efficient and many times the buses were very full. This is something to keep in mind when making your plans. If you rent a car, Malta drives on the left! This impressive structure is the fifth gate to be located at this site. It makes for a grand entrance to Valletta, the capital of Malta. As you enter, look down into the ditch and see how deep it is. 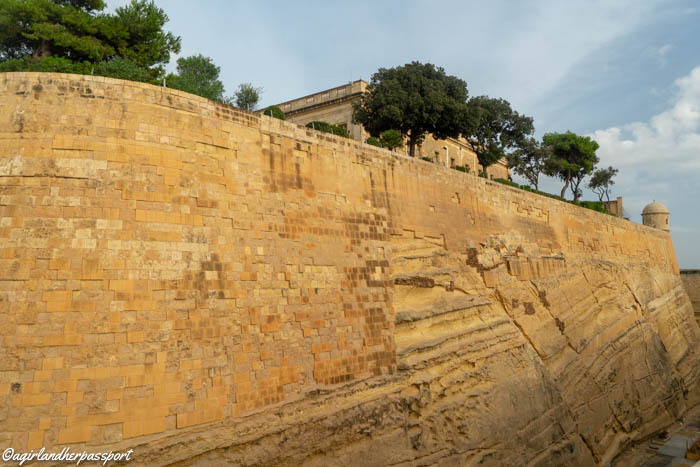 You can also see the curtain wall that surrounds much of the city of Valletta. The Valletta City Gate takes you to Republic street which runs all the way to the other side of the city to Fort St. Elmo. It is a great street to walk down, see local life and many sites. Since Valletta is small, you can easily walk everywhere you want to go, just beware of the hills. St. John’s Co-Cathedral is one of the most ornate cathedrals I have ever seen. 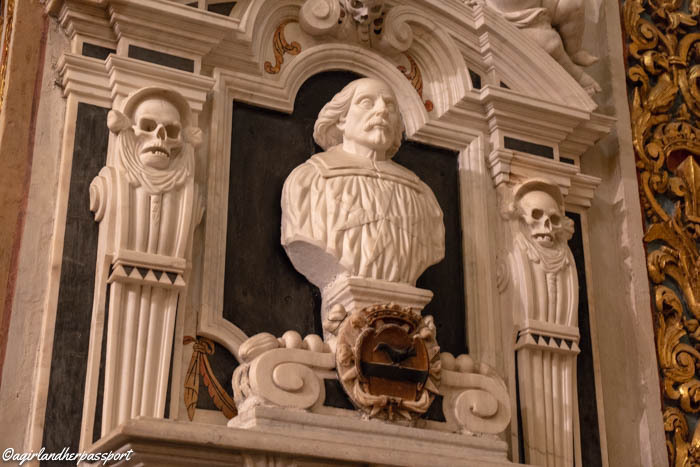 It is decorated in the Baroque style. 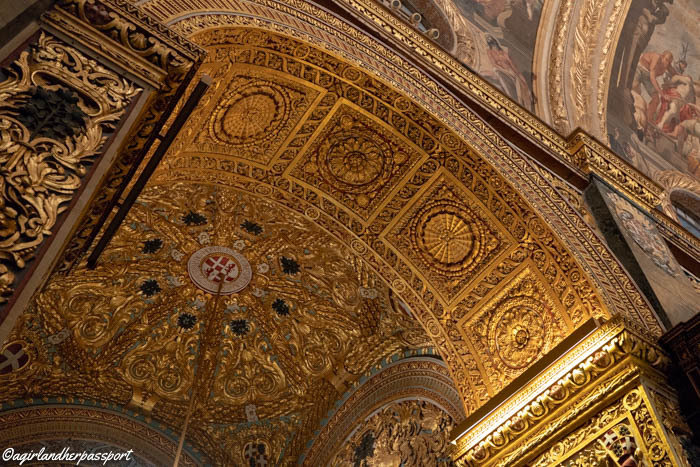 The construction was completed in 1577, however, the Baroque interior wasn’t installed until the 1660s. There was a line to get into the cathedral, so go early and be prepared to wait. The cost to get in was €10 for adults. It was very crowded as they don’t seem to limit the number of people they allow inside. Fort St. Elmo is a star fort, meaning it is shaped like a star. 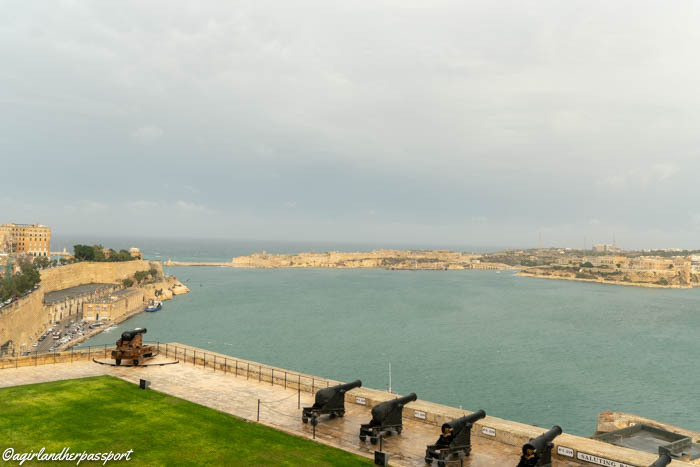 While there was a small post present prior to 1552, the current fort was started in 1552 after Malta was attacked by the Ottomans. Malta was attacked again by the Ottomans in 1565. The fort offers stunning views of the surrounding harbors. The fort now contains the National War Museum. It costs €10 to enter for adults. The gardens offer the best view of the Grand Harbour. 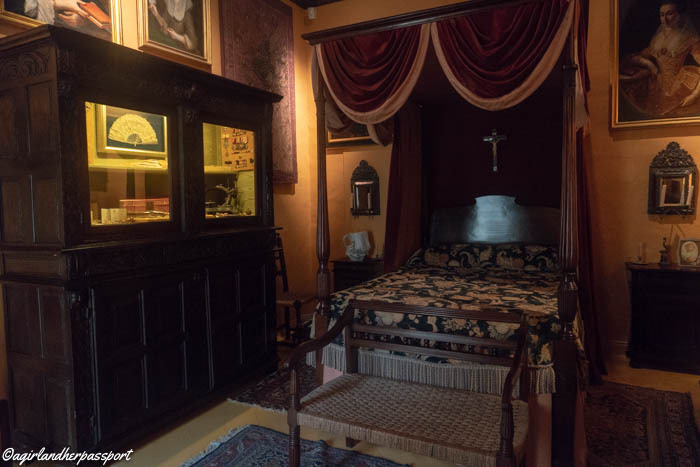 They were originally built as a place of recreation for the knights of the Italian language of the Order of St. John. It is a great place to relax and watch boats enter and leave the harbor. For the gardens, you can see the cannons of the Saluting Battery. Twice a day the cannons are fired. Once at noon and again at 5:00 pm. Both the gardens and cannons are free. 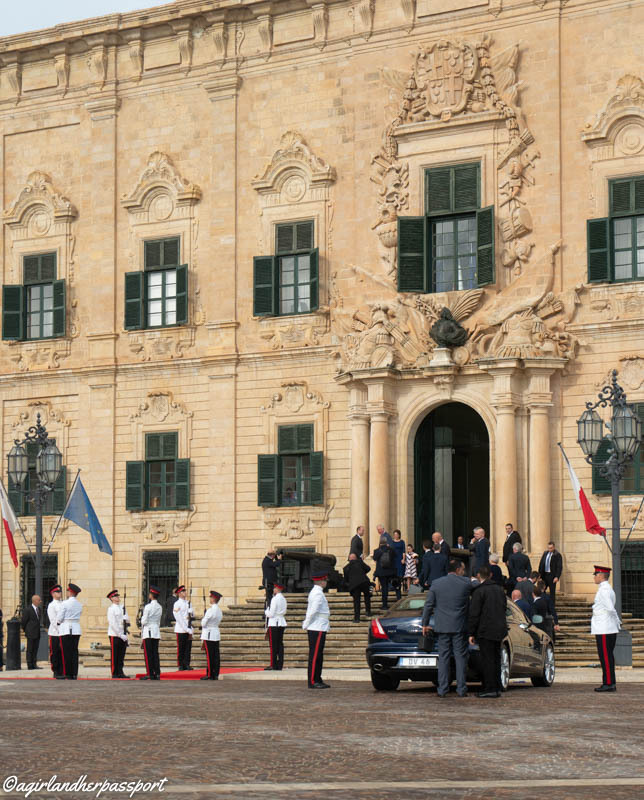 This is the office of the Prime Minister of Malta. The building is in the Baroque style. You can go in on a guided tour. Unfortunately, I didn’t know about this when I was there and so I didn’t get to go inside. Even though I couldn’t go inside, I noticed a crowd gathering outside and guards. I began to ask around as to what was happening and people said Prince Charles was coming! About 45 minutes later, he finally arrived and I was able to get a couple of photos. Just wish I had my telephoto lens! The guards were pretty impressive as well. 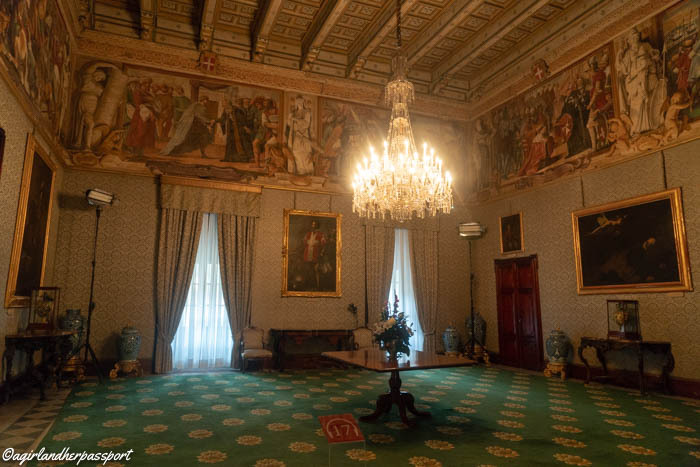 The Grandmaster’s Palace is one of the most popular things to do in Malta. Built between the 16th and 18th century, the Palace was built for the Grand Master of the Order of St. John. The order ruled Malta from 1530 to 1798. This rule had great effects on Malta, which can still see today in the many forts, bastions, and towers they built. The Palace is home to the State Rooms and the Armoury. Both can be visited for the entrance fee of €10. 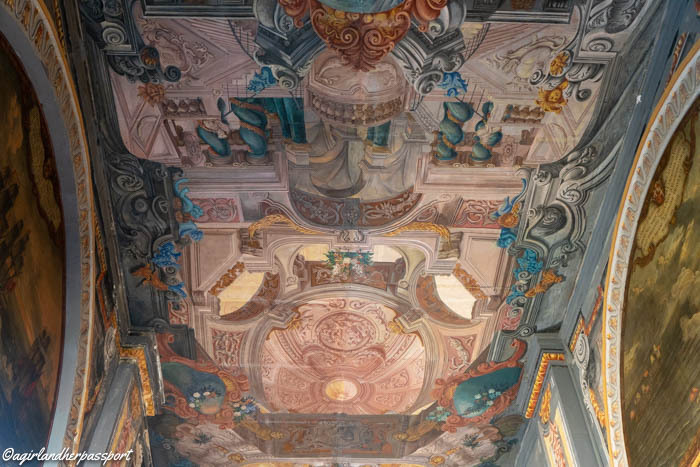 Be sure to look up and down in the State Rooms as some of the ceilings have great paintings on them. Also, walk around the courtyards to enjoy the architecture. 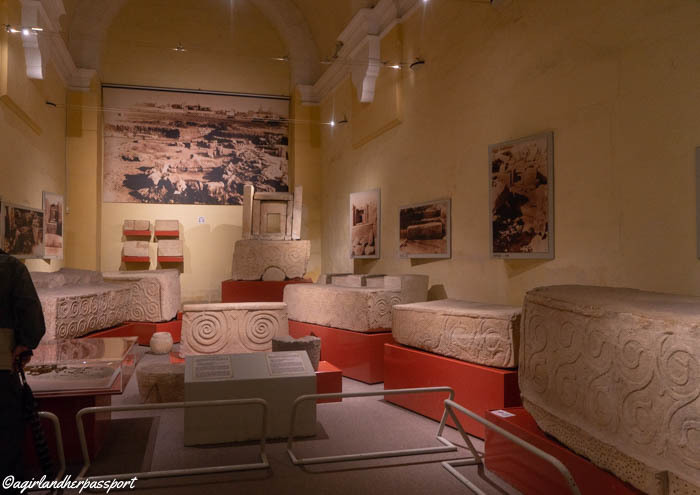 Every history lover will need to stop here to discover the ancient history of Malta. Artifacts inside range from 5000 BC to 400 BC. The museum is not large, but definitely has some interesting things on exhibit. 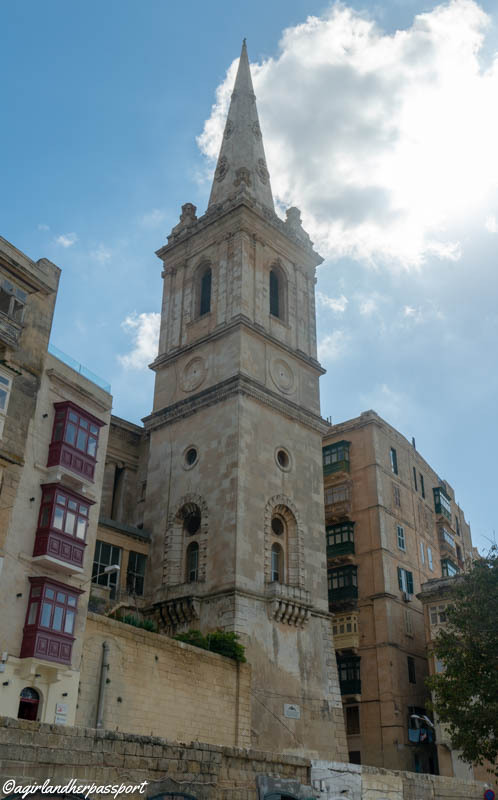 It is located on Republic Street in Valletta. One of the highlights is the “Venus of Malta.” Having seen the real Venus, I was expecting a statue of a woman. It is a statue but it is about three inches tall. It is still stunning, but much smaller than expected! Many of you Game of Thrones fans will recognize this gate from the third episode of season one. The Mdina gate is the main entrance into the city of Mdina. 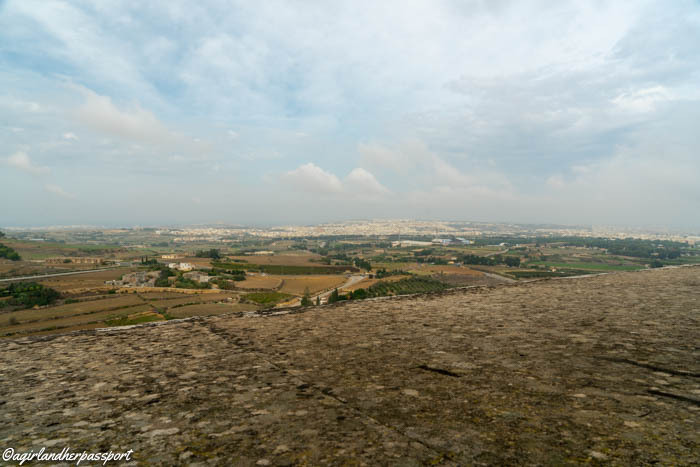 Mdina is also known as the ‘quiet city’ because very few cars are allowed to drive inside. 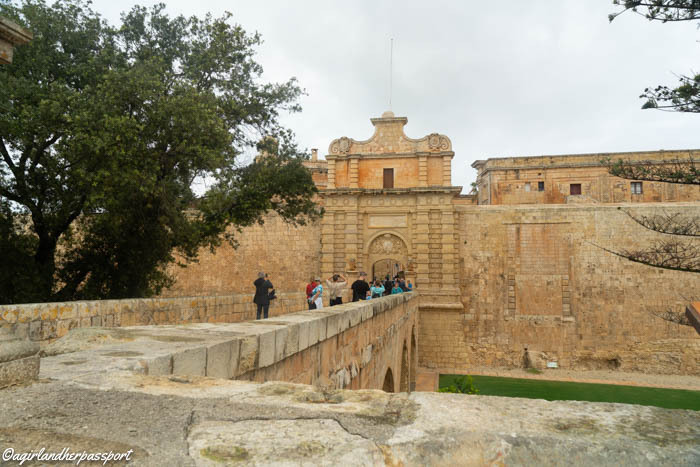 If you arrive at Mdina by bus or taxi, the Mdina Gate is the most likely place for them to drop you off. The Mdina Gate was built in 1724 as the new entrance to Mdina. To the right of the gate, you can see the walled up medieval gate that was the entrance before. You can also get a good look at the city walls from the bridge to the gate. The official name of this cathedral is the Metropolitan Cathedral of St. Paul. 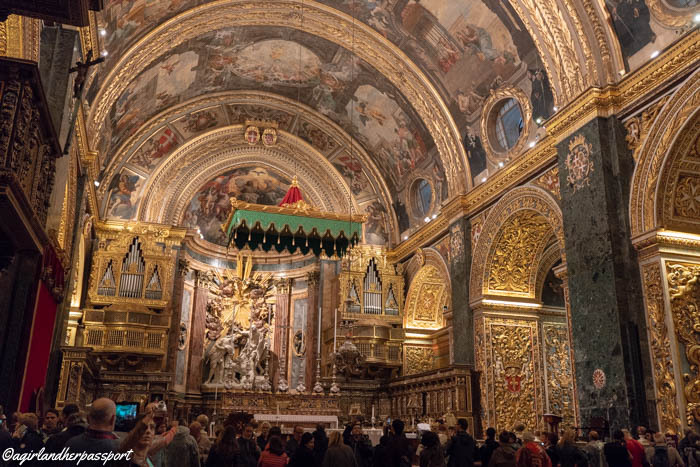 It is located inside the city of Mdina. The current cathedral was built from 1696 to 1705 after the previous one was severely damaged in an earthquake in 1693. 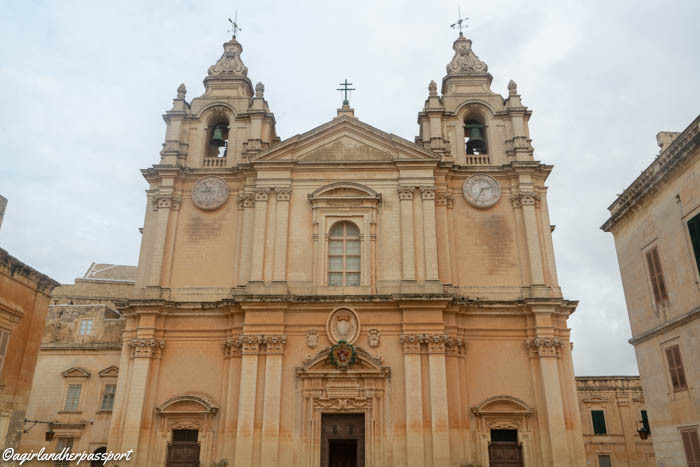 The exterior is built in the Baroque style, like many of the historic building in Malta. It has a commanding presence in the square it occupies. While not as gilded as St. John’s Co-Cathedral, St. Paul’s has some beautiful frescos on the ceiling. Several frescos have adorned the ceiling and been destroyed in earthquakes and repair work. Right next door to the Cathedral is the museum. Unfortunately, no photography was allowed inside but the artifacts were stunning. Some of the silver pieces were bigger than me. There are also silver and gold statues of the apostles. The museum also houses a rare coin collection that spans 2000 years. The building the museum is located in is the former Seminary. It was built between 1733 and 1742. The museum was moved from the cathedral to the Seminary in 1969. The entrance fee includes the museum and the Cathedral. When I went you had to buy your ticket at the museum first then go to the Cathedral. This was one of those gems I found by accident. I passed the entrance to this house and the courtyard caught my eye. It was then that I realized I could go inside. I really had no idea what it was all about but I love a historic house. The house was likely built in 1495 incorporating a synagogue that was next to the site. 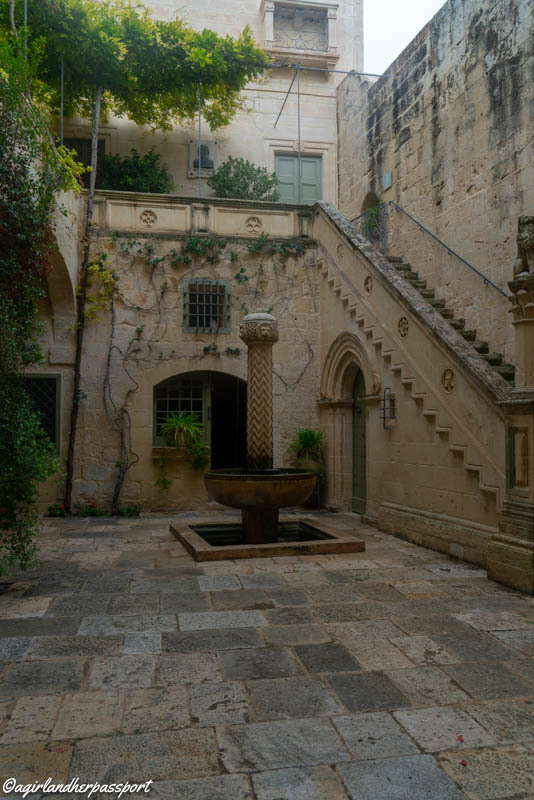 This makes it the second oldest house in Mdina. There is some doubt as to if the Falsone family ever lived in the house or if it was just named after them. 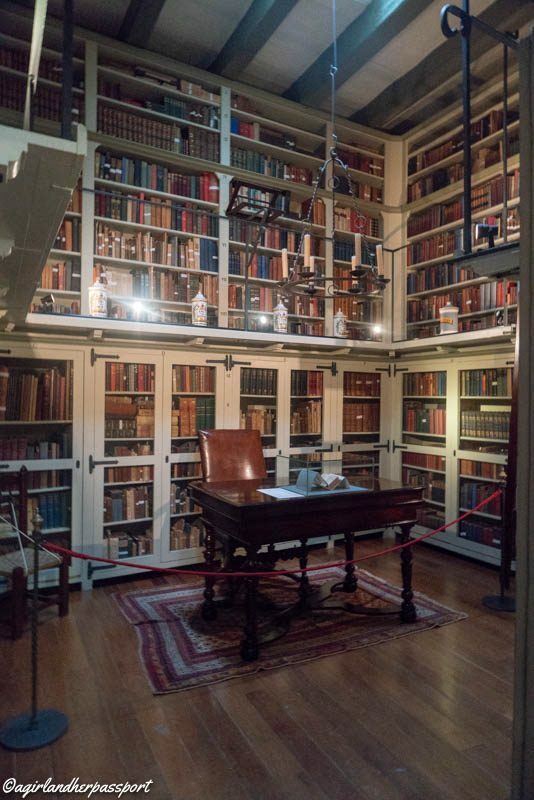 Now it operates as a museum that represents a house, which is divided into 17 rooms. My favorites were the library and the kitchen. An audio tour is included in the entrance fee. 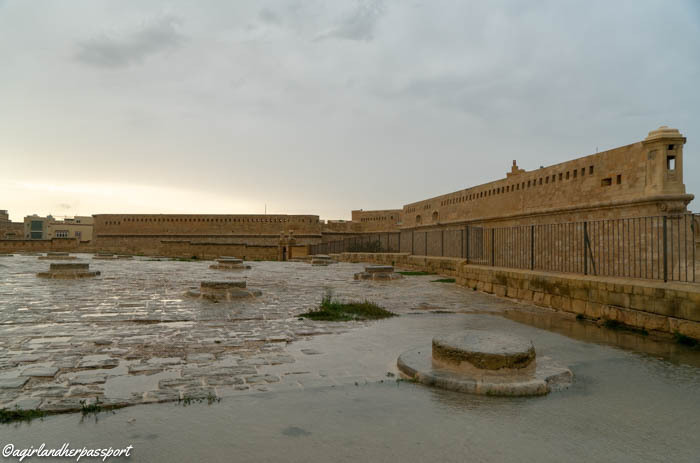 A short walk from Palazzo Falson is Bastion Square. It is the perfect place to rest a bit and eat a gelato! There is a gelato shop right in the square. Not only that but it offers amazing views of Malta! You can also get a sense of the thickness of the city walls here. 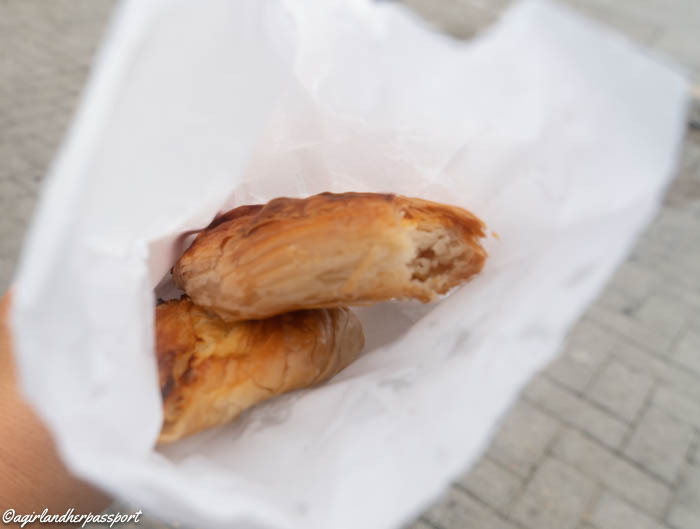 A Maltese pastry, called a pastizzi is a must eat while at Mdina. The Crystal Palace, probably the oldest pastizzi shop on the island, is located right outside Mdina in Rabat. The pastizzi, flaky pastry puffs, comes with either ricotta cheese or mushy peas inside. I ordered two because they are so cheap, but if you aren’t that hungry just get one. They are bigger than they look. Mine was very hot as they had just come out of the oven. One was a perfect cheesy snack! Going to the beach is what most people come to do in Malta. 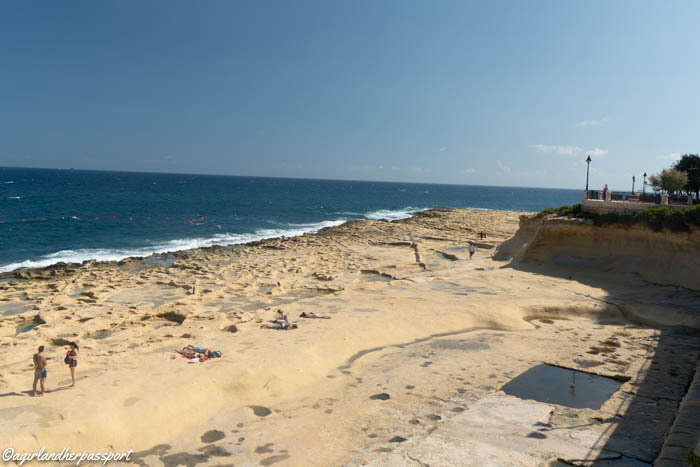 You can swim right off the rocks in Sliema. There are places to lay out and sunbath there as well. However, it is all flat rock in this part of Malta so you might want to bring something soft to lay on. What I thought was great was the small pools that had been carved into the rocks to sit in. There were also several beach clubs along the beach. It was too chilly for me to swim, but I enjoyed watching the water from here. Plus you can walk along the street above the beach get great views of the coast. When the weather is good, you can take the Sliema Ferry to Valletta. It is the more time efficient way to get to Valletta than the bus. Best of all it offers great views of Valletta from the water. Some of the most iconic views can be seen this way. When you arrive in Valletta, you can walk up the hill to Valletta or take a mini bus to the center, which is an extra charge. Then on the return, you get great views of Sliema. 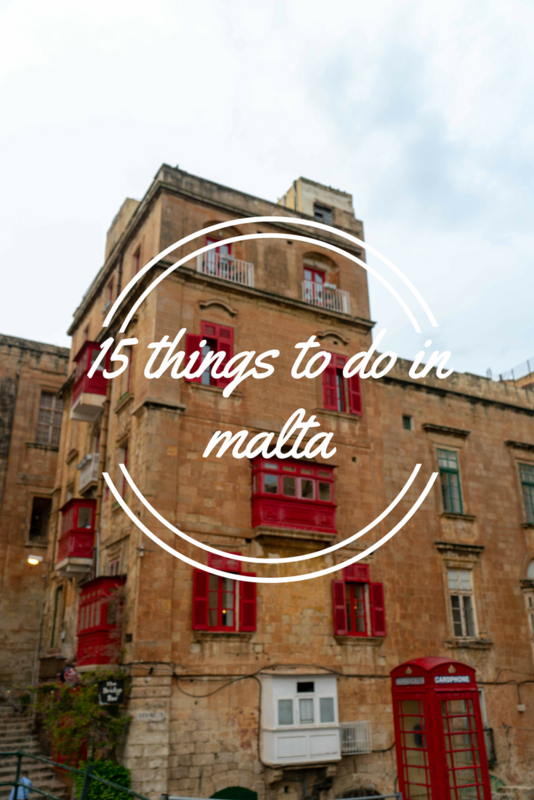 There is so much more to do in Malta and on the other two islands, but I was only there for three days and as I mentioned two were rainy so I didn’t get to Gozo or Comino. Have you been to Malta? What is your favorite part? this post…Great websites! Thanks for sharing. Thank you! So glad you found it inspiring.